Regardless of your age, routine dental cleanings and checkups as part of our general dentistry treatments are vital to your oral health. They are the best way to detect dental problems at their earliest stages so that you can avoid the time, pain and money of more invasive treatments. At Riverheart Family Dentistry, we see most patients twice a year for dental cleanings and checkups. Dr. Schwarz is an experienced and skilled dentist who is equipped to address the changing oral health needs of patients through each stage of life. It is our mission to provide superior, patient-centered dental care in an environment that feels like home. Therefore, your routine dental checkup will be a positive and rewarding experience, and never something you dread. Helping patients achieve their most confident smile is what we do best. At Riverheart Family Dentistry, this starts with top quality preventative care. Our practice proudly adopts the latest technique and technology in modern dentistry. This enables us to provide dental care that is more comfortable, faster and safer than ever before. We utilize this state-of-the-art technology in our preventative services as well as our restorative and cosmetic procedures. 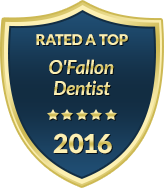 Your smile deserves the very best and we are proud to offer that to families in O'Fallon. If your dental checkup revealed an area of concern, you can trust that Dr. Schwarz is equipped to handle it. Riverheart Family Dentistry provides complete dental care with services ranging from crowns and root canals to extractions and dental implants. Regardless of the type of dental work you may need, we create smiles that retain both function and aesthetics for years to come. To schedule your dental cleaning or a checkup for your child, please contact our office today. We accept most dental insurance plans and we offer family block appointments for your convenience.